Friday 5th of February 2016. As tradition has it, our famous and much acclaimed Hint o' Burns will be the first event of the year for the Dundee Sailing Club. All are welcome again this year, please bring friends and family as many as you like, everyone is welcome though space is limited so book in advance. 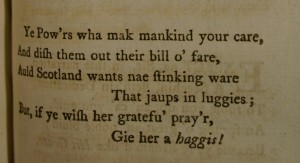 1787 Edinburgh edition of "Poems, chiefly in the Scottish dialect". From University of St. Andrews special collection. A piper will lead in the Haggis. There will be the traditional fare of Haggis neeps and tatties with Clootie dumpling to follow, drinks available from the bar. Vegetarians will find themselves well catered for. Address the Haggis and also the much loved "Toast to the Lassies" and the reply. Other entertainment will be provided by "Itchy Feet" and friends, including traditional music. There will be a multiple prize raffle (any donations towards prizes gratefully received) and Dancing. All for only £15.00, children over 12 half price and those under 12 free. Arrive at 7 o'clock for 7:30. Contact us to reserve your place and make a note in your diary or mobile. The Venue is The Masonic Hall Brook Street Broughty Ferry.